LAST PIECE Ballerina Soldier and Gingerbread green double sided quilted Christmas Fabric 30"x43"
Please scroll way done to see all the description. This is adorable Prequilted double fabric approximately 43" wide! Sold by the 30"x43" amount. 100% cotton fiber and 100% polyester batting is inside. 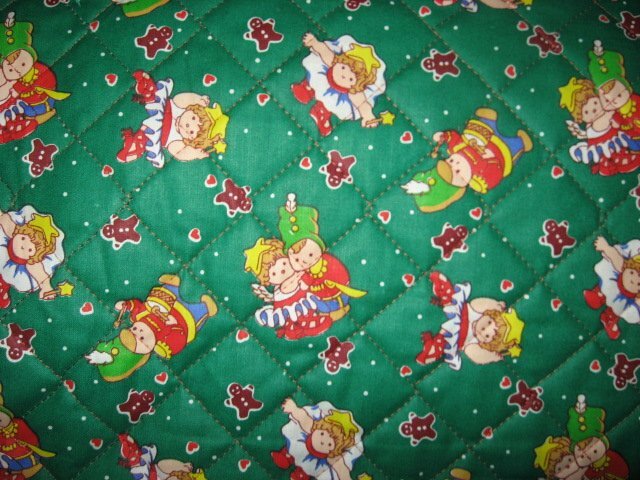 Bright green with little ballerinas and soldier toys with gingerbread men and hearts on one side. Pretty green backside with tiny gingerbread men and hearts. Great for making reversible children's placemats and table runners or Christmas stockings. Please view my other listings on this website.